Wastewater engineers working for Lanes Group used heat generated by the light on their CCTV survey camera to keep a dog warm before digging down to rescue it from a drain. Spencer the cocker spaniel had been trapped beneath a sports pitch for more than 36 hours when he was released through a hole smashed in the privately-owned clay pipe. Thames Water called in Lanes Utilities, its wastewater network maintenance partner, after it was alerted to the plight of Spencer after he had already spent nearly three days in the 300mm-diameter pipe. His owner, Kat Athey, had been taking him for a walk in Tilsey Park, Abingdon, Oxfordshire, when Spencer dashed into the pipe outlet. When he failed to come out, Kat realised he was in trouble. Over the next 36 hours, Oxfordshire Fire and Rescue Service, a drainage contractor that worked for the landowner, and an expert in freeing ferrets from underground holes all tried to find and rescue Spencer, with no success. Thames Water was notified late in the evening on Monday 5 February, the third day of Spencer’s disappearance, and immediately mobilised a team from the Lanes Utilities service hub in nearby Kidlington. Lanes Utilities Regional Manager Matt Hughes said: “We sent a mainline CCTV drainage survey camera unit, and the team located Spencer 103 metres up the drain pipe, and about five feet below ground. “We could see he was still breathing, but couldn’t get a proper sense of his condition because he was clearly wedged in the pipe, and couldn’t turn around. 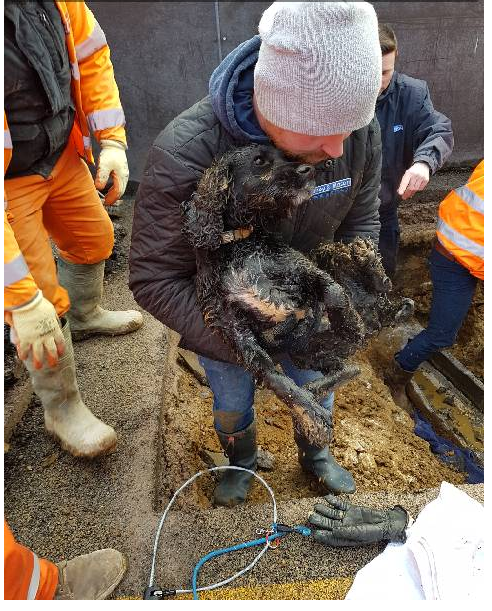 Very early the following day, an excavation team from Lanes Utilities’ civils partner, Cappagh Browne, arrived on site, along with an RSPCA officer called in by Lanes to advise them during the rescue. An ultra sound device was used to locate the best place to dig. It happened to be just where an artificial grass sports pitch was being laid for a school. So, the first job was for the surfacing contractors to cut a section and, with the help of 20 people, roll it back. Lanes Utilities Technical Specialist Paul Edwards said: “We wanted to work as quickly as possible, but we were concerned that noise and vibration from digging equipment might badly affect Spencer in his weakened state, so we consulted the RSPCA officer at each step. “We uncovered the pipe as close to Spencer as we could, then broke into it at a distance from him that we calculated would be safe. As it turned out, we were less than an arm’s length behind him. “We then invited Mrs Athey to go down and try to coax Spencer out. When it was clear he couldn’t move, a Thames Water colleague, Jason Major, who has long arms, reached in and pulled him back a few inches. Watched by fire fighters who had returned to the scene after coming of shift to see if Spencer had been rescued safely, Spencer was placed in a blanket and taken straight to a veterinary practice. He was found to be dehydrated and placed on a fluid drip for a time, but other than that, he was okay to go home.